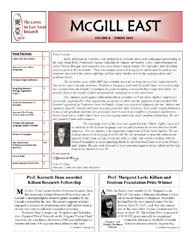 The Centre for East Asian Research (CEAR) is affiliated with the McGill Department of East Asian Studies. The Centre produces an annual newsletter and also posts a weekly E-bulletin of local news and upcoming events related to East Asia. Please see below for more information. Every Friday, CEAR sends out an E-bulletin announcing upcoming events, performances, film festivals and lectures related to East Asia coming to McGill and to the Montreal area. If you want to receive this announcement, please send asian.studies [at] mcgill.ca (an email) with your first and last name. We welcome your suggestions! If you have, any information you believe would be of interest to the members of this listserv, or if you have any announcements to make, please send us asian.studies [at] mcgill.ca (an email) .